Great for any Renaissance Ensemble! Assassin's Creed II: Ezio Shirt - Small/Medium - this item is being discontinued and is priced to sell!! If you want to mimic Ezio's look from Assassin's Creed II, you're going to need this shirt. It's the pivotal accessory of his uniform. It's what makes Ezio Ezio. 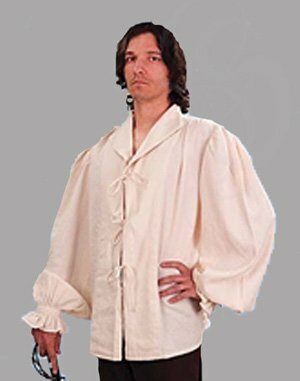 This shirt is from Assassin's Creed II and is great to complete the Ezio ensemble, or for any Renaissance ensemble! This extremely soft, lightweight shirt is a poly-cotton blend. Light peach color. Dry Clean only. Choose from sizes Small to Medim or L/XL.